The Yankee went back for seconds! 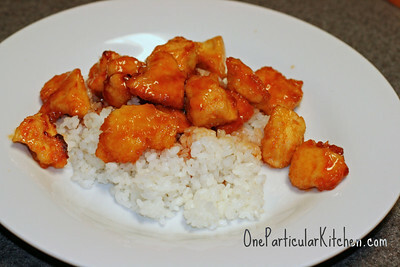 I found this recipe here and here, then went about a couple modifications; The Yankee and I were in the mood for something with a little more kick, more like General Tso’s chicken than sweet and sour. The Kiddo, shockingly, was in the mood for Cheerios. Now bake at 325, turning chicken every ten minutes or so, for about half an hour or until chicken is cooked through. When chicken is done, turn the oven to broil to really sizzle the sauce and reduce it a bit, and give the chicken some great texture. Be sure to turn the chicken once to crisp up both sides. If your little heart so desires (mine did), you can make up a second batch of sauce and simmer it on the stove till it’s reduced. I served this with sushi rice and it was delicious! Not as quick as take-out, obviously, but great quality and no MSG. Two thumbs up for that! This looks great! I will definitely give it a try soon. Well if some is good, more must be better, right? 😉 Glad you liked it! Does BG eat such things? To answer your question from, oh, a month ago–Baby Girl likes rice with this sauce, but rejects the actual chicken for some reason. She’s weird. Anyway–let’s hypothetically say you were halfway through this recipe and realized that you don’t have any eggs ( or milk, buttermilk, or any other remotely reasonable substitute for the coating of the chicken)–you may be able to make do with a little water and honey mixed together. It’s more of a grilled chicken effect, but wasn’t much different otherwise. 🙂 Hypothetically, of course. I would never actually be out of every kitchen staple known to man all at the same time. Nope. I used a little less vinegar, too. I just finished inhaling this for dinner! I halved the chicken portion down to 5 tenders (only feeding 2), but left the sauce recipe as is so I could simmer some down for dipping. I served it with stir fry veggies over rice with sauce drizzled over it and it’s fantastic. YUM!! I love how easy and non-messy the breading process was. Thanks for that! Thanks for this recipe. It sounds delicious. I have been looking for a recipe for SweetFire chicken (Panda Express) which I have been unable to find. This should be close—if I add a little pineapple and red bell pepper.